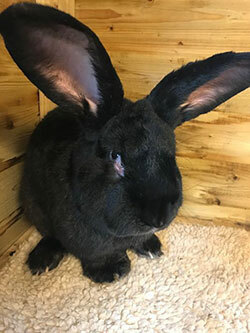 As if it didn’t have enough problems pleasing human pax, UA is now being sued over the death of a giant rabbit after a flight from London to Chicago. A group of businessmen from Iowa filed a lawsuit yesterday, more than three months after airline workers found the continental rabbit named Simon dead on April 20. The animal had been placed in a United kennel in Chicago’s O’Hare airport while awaiting a connecting flight to Kansas City, where his new owners planned to pick him up. The lawsuit seeks an unspecified amount of money to cover the costs of the rabbit as well as punitive damages. Guy Cook, a lawyer, represents three Iowa businessmen who bought the rabbit with the intention of showing him at the Iowa State Fair and then displaying the animal and selling related merchandise to raise money for the annual event. The suit does not explain how the rabbit died but puts forth several theories, including that it was exposed to low temperatures in the cargo compartment or that dry ice might have been left in the same compartment as the animal. The suit comes as UA struggles to repair its image after the videotaped enforced removal of a passenger from an aircraft at O’Hare airport.